Anteaters have low body temperature compared to other placental mammals, just 32.7 degrees of Celsius. Anteaters are unusual creatures that can be found in Central and South America. There are four species of of anteaters: giant anteater, silky anteater, northern tamandua and southern tamandua. Anteaters have 4 inches long claws and they use them to defend against jaguars and cougars. Their habitats include dry tropical forests, rainforests, grasslands, and savannas. They have a lifespan between 2 and 14 years in the wild, depending on species. The giant anteater can live up to 26 years in captivity. Anteaters vary in size according to their species. 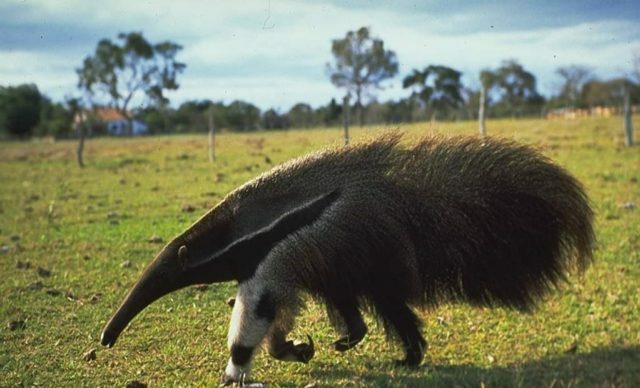 The giant anteater is up to 2.1 meters (7 feet) long including the tail; the silky anteater [photo below] is about 35 centimeters (14 inches) long; the southern tamandua is about 1.2 meters (3 ft 11 in) long and the northern tamandua of similar dimensions. Anteaters are solitary animals and they gather only during mating season. Group of anteaters is called "parade". Digestion is facilitated by specifically designed stomach that grinds large quantity of ants and termites. Their stomach produces formic acid instead of hydrochloric acid (which is normally found in other mammals). They can eat up to 30 000 insects per day. All anteaters have elongated snouts equipped with a thin tongue that can be extended to a length greater than the length of the head; their tube-shaped mouths have lips but no teeth. They are specialized to feed on small insects. Their dense and long fur protects them from attacks from the insects to some extent. The anteater’s tongue is covered with thousands of tiny hooks called filiform papillae which are used to hold the insects together with large amounts of saliva. The anteater uses its sharp claws to tear an opening into an anthill and put its long snout and efficient tongue to work. Their long tongues are more than sufficient to lap up the 35,000 ants and termites they swallow whole each day. Since ants can bite, anteaters must eat them quickly. They are flicking their tongue 150-160 times in minute during feeding to grab enough ants and avoid bites. But it has to eat quickly, flicking its tongue up to 160 times per minute. Ants fight back with painful stings, so an anteater may spend only a minute feasting on each mound. Anteaters never completely destroy a nest. The insects can repair their damage quickly and the anteater is able to return to the nest to feed again. Some anteaters, the tamandua and the silky anteater, ply their trade in the trees. They travel from branch to branch in search of tasty insects. Anteaters catch ants and termites through the hole on the top of the anthill. In addition to ants and termites, anteaters also eat soft-bodied grubs, soft fruits and even birds’ eggs. Anteaters have poor sight but an excellent sense of smell, and most species depend on the latter for foraging, feeding, and defence. Their hearing is thought to be good. All four types of anteater are mainly nocturnal (active during the night), but the giant anteater can also be diurnal (active during the day). Anteaters are mostly solitary mammals prepared to defend their territories. Tongue can be 2 feet long. It is narrow and covered with tiny spines. Pregnancy lasts 190 days and ends with single baby. Little anteater stays with mother 2 years or until she becomes pregnant again. Mother carries the baby on her back during the first year. They never destroy anthill because they plan to come and eat another portion of ants in the future. When a territorial dispute occurs, they vocalize, swat, and can sometimes sit on or even ride the back of their opponents. Once a year in mating season they come together in pairs and will stay together for a few days. Female anteaters give birth to a single baby (twins are rare) after a gestation period between 120 to 190 days, depending on species. Little anteater stays with mother 2 years or until she becomes pregnant again. Mother carries the baby on her back during the first year. They use their long and sticky tongue to catch prey. Anteaters sleep up to 15 hours per day. They don’t make much noise unless upset. Huffs and puffs, hisses a sort of growl which is done on an inhale. Baby’s make some chirps and whirs sorta. The main predators of anteaters are pumas, jaguars and humans. Anteaters are not aggressive but they can be fierce. A cornered anteater will rear up on its hind legs, using its tail for balance, and lash out with dangerous claws. The giant anteater’s claws are some 10 centimeters (4 inches) long,and can fend off or even kill their main predators, big cats such as jaguars and pumas. All species except the giant anteater have a long prehensile tail (the tail of an animal that has adapted to be able to grasp or hold objects). The tongue on a giant anteater can protrude more than 60 centimeters (2 feet) to capture prey. Anteaters can be small as a squirrel (silky anteaters) or 7 feet long, counting from the tip of the nose to the end of its tail (giant anteaters). Anteaters live up to 15 years in the wild and 25 years in captivity. With a body temperature fluctuating between 33 and 36°C (91 and 97°F), anteaters have among the lowest body temperatures of any mammal. The anteater’s stomach, similar to a bird’s gizzard, has hardened folds and uses strong contractions to grind the insects; a digestive process assisted by small amounts of ingested sand and dirt. Anteaters are very careful to avoid the dangerous and aggressive Soldier Ants. A group of anteaters is called a parade. The latin tearm for anteaters, Vermilingua means “worm tongue“. The anteaters are more closely related to the sloths than they are to any other group of mammals. Their next closest relations are armadillos. The name “anteater” is also colloquially applied to the unrelated aardvark, numbat, echidnas, pangolins and some members of the Oecobiidae. They have poor eyesight, but excellent sense of smell. They can detect smell 40 times better than humans. Anteaters use their nose to find food.